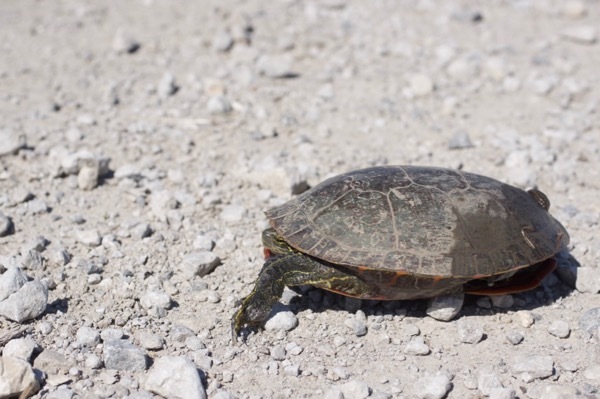 My mom took me to Walden Ponds while we were visiting because she had seen turtles there in the past, including one in the middle of a trail a long way from water. 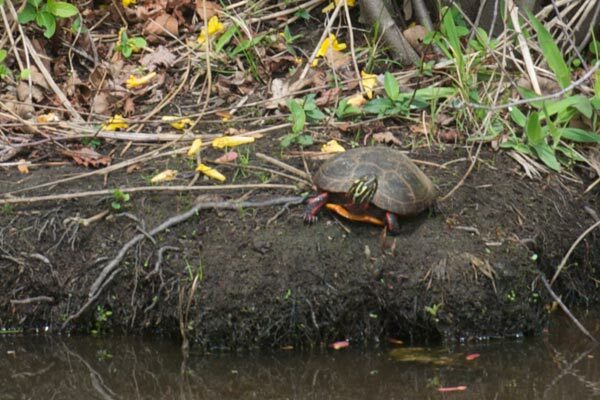 We saw several of these Painted Turtles, but none of them were gallant enough to climb out of the water and pose. Mostly we had to just admire the turtle heads popping out of the water from time to time. None of the numerous pond turtles around Perry County Lake would let me get near enough for a closeup, so I took a lot of shots at a distance and only later figured out which turtles I had photographed. (In this particular case I got help from the herp hive mind at fieldherpforum.com.) 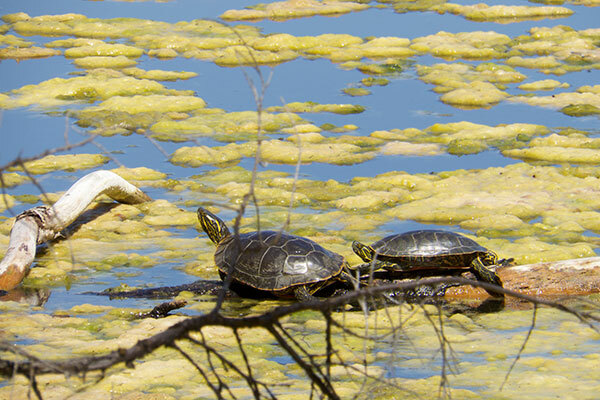 There turned out to be two species hanging out together here; the two on the outside are Red-eared Sliders, and the four on the inside are Western Painted Turtles. I had spent two weeks in Canada, primarily in the Rocky Mountain National Parks (Banff, Jasper, Waterton Lakes, Yoho, etc. ), without setting eyes on a single reptile. 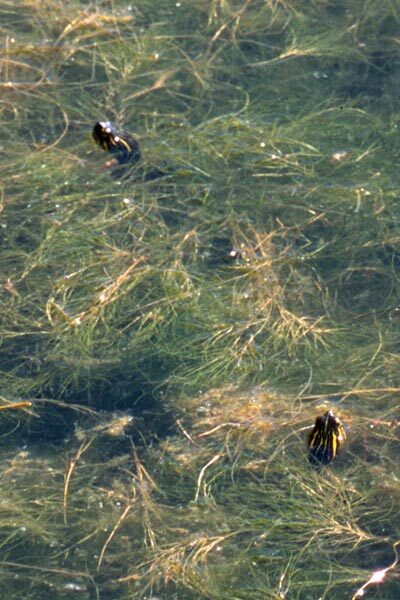 (I did see a grand total of one amphibian.) On our way down to the border, we stopped at a rest area to stretch our legs and try to get our dogs to stretch their legs and other parts that might need stretching. 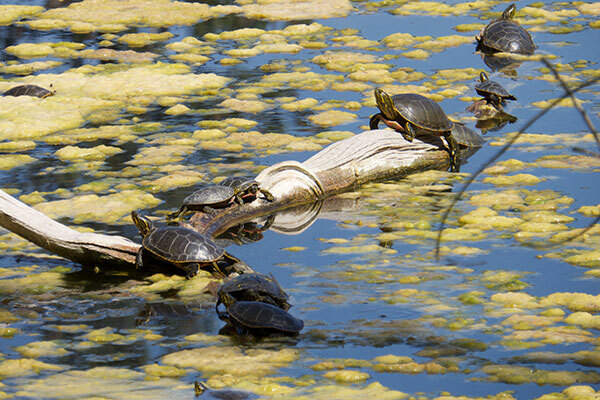 The rest area happened to be located next to a large pond or perhaps a small lake, which happened to be home to a thriving population of turtles. The reason this turtle looks so smug is that it knows that I want to take a less obscured photo and it also knows that if I make the slightest move to do so, it will instantly disappear into the water. 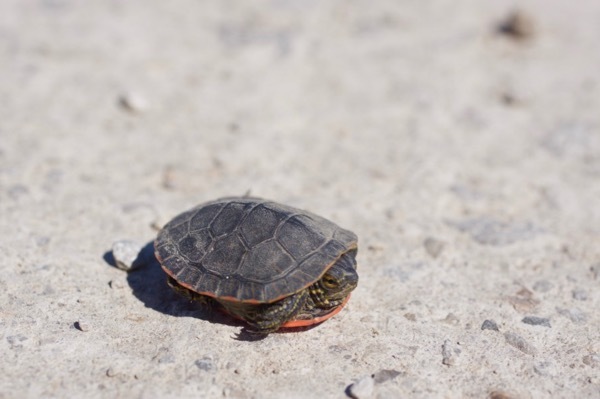 Would it be too much to ask one of these little turtles to stick its head out of its shell for a photo? Yes, it would. Dismal Swamp Trail used to be a two-lane highway (Route 17) along a section of the Dismal Swamp Canal. It was converted to a trail on which pretty much everything is allowed (hiking, cycling, rollerblading, skating, horseback riding, etc.) other than driving a motorized vehicle. We stopped by to eat our lunch, and I spent half an hour or so trying to sneak up on various turtles, fairly unsuccessfully. 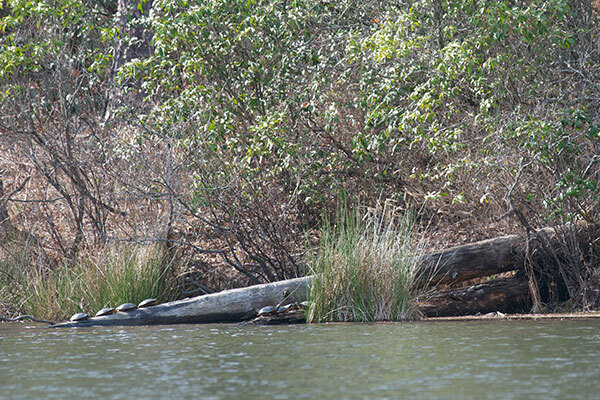 This partly-submerged log was on the far side of the lake from the Oconee State Park campground. Around dusk we were hanging out in camp chairs admiring the scenery when I noticed the little shiny bumps on the end of the log. 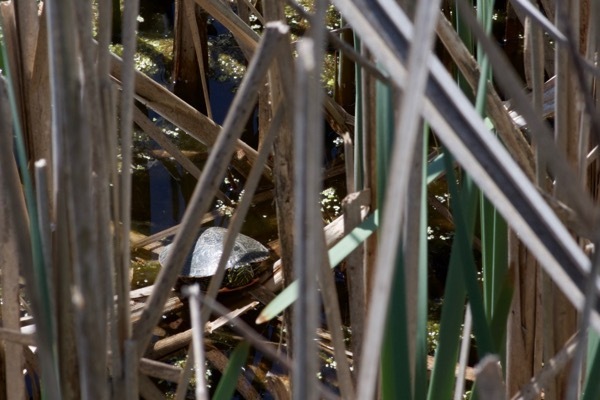 I suspected turtleness, but couldn't tell for sure until I looked through my camera's telephoto lens. Definitely turtleness. 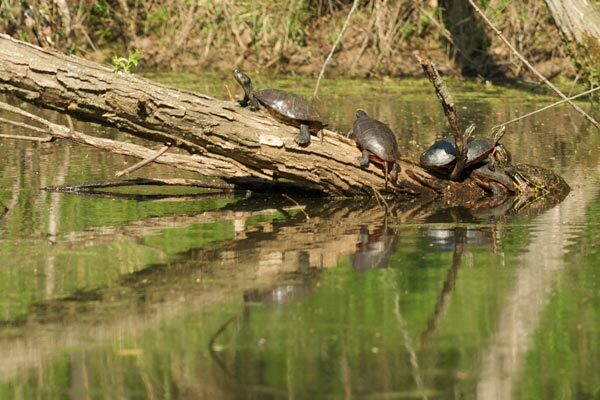 I didn't notice the other four turtles on the other partially-submerged log in front of the more obvious one until I looked at the photos on my computer. 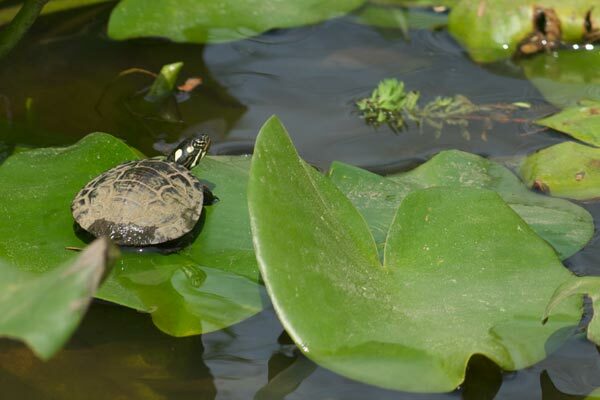 It's not easy to identify turtles at this distance, but it appears that Chrysemys picta is the only pond-type turtle in this area, and the shell shapes and hints of color look like a good match for that species.